The VAT-free offer runs from 1st April until the 30th June 2019 and applies to the Bahia and Hydro 80 ride-on mowers. If you require a large ride-on mower, Etesia UK has announced a ‘try before you buy’ offer. Following a demonstration with an Etesia member of staff in attendance, customers will be presented with a cheque which will entitle them to an additional £500 discount on the purchase price of the Buffalo 100 range (BVHP2, BVHPX2, BPHP & BPHPX models) or a £1000 discount on the purchase price of the Hydro124 range (H124 DX, H124DN and H124DL models). This offer is in addition to any discount the customer undertakes with the supplying dealer and runs until 31st December 2019. Etesia UK Managing Director Les Malin said: “The exceptional success of our VAT offer a few years ago meant we were understandably keen to offer the discount again. 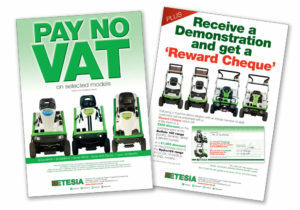 *These offers are available at participating Etesia UK dealers until the dates specified above or until stocks last. The VAT-free price refers to the VAT element removed from the suggested retail price. until the dates specified above or until stocks last. The VAT-free price refers to the VAT element removed from the suggested retail price – VAT will be paid on the lower promotional price. Terms and conditions apply. To arrange a demonstration and get your Reward Cheque call 01295 680120. To pay no VAT, locate and contact your local dealer here.